There were several other nice cryptic suggestions in the comments section, plus some on Twitter, so very well done to everyone who worked out what this was. The species gets the name vespulae from its affinity with wasp nests, where it feeds on dead wasps and the scraps of insects that the adult wasps feed their larvae, so they’re sometimes called the Wasp-nest dermestid. These tiny beetles can strikes terror into the heart of a museum curator, since they are well adapted to feed on dried insect remains (of which we have huge numbers making up our collections) and they are parthenogenic – meaning that they reproduce without mating (only females of the species are known) and just one individual is all it takes to create a full-blown infestation. You can tell them apart from some of the other dermestid beetles (many of which are also museum pests) because they have ‘hairy’ elytra (or wingcases) with a lighter coloured patch on each of their ‘shoulders’ (they’re not shoulders, but you probably get what I mean). If you find one of these wee beasts in your collection, be afraid – be very afraid! There were a variety of great responses, with some fantastic cryptic clues, including an anagram by Claire Miles (great stuff!). Most opted for this being Stegobium paniceum, which is also known by the aliases Drugstore Beetle, Biscuit Beetle or Bread Beetle. However, the mystery critter has a subtly different pronotum (that’s the plate over the thorax that extends over the head). Another suggestion was woodworm or one of the false powderpost beetles, which covers a range of wood-boring beetles, with Liberty Hightower correctly giving the more taxonomically constrained suggestion, of something from the Tribe Anobiini (which includes Stegobium). However, my colleague Olivier sent me an email with a very definitive identification, informed by a past experience with this particular pest – the Furniture Beetle Anobium punctatum De Geer, 1774. These beetles have a distinctive pronotum that supposedly looks like a monk’s cowl, with a more distinctive hump and slightly pinched looking back section than the more smoothly curving pronotum of the Stegobium. They fall into the broad category of woodworm because their larvae feed on wood, making tunnels hidden from view and only becoming visible when they emerge from small holes in the wood as adults, leaving a little pile of wood dust as they go. The presence of these beetles in a toilet isn’t related to the water in the bowl or even wood of the seat – it turns out that there was a window above the toilet and the adult beetles, in an attempt to leave the building after emerging, were attracted to the light from the window and flew into the glass only to bounce off and land in the toilet. This attraction towards light in the dispersing adult stage of the beetle is a handy behaviour if you want to keep track of these pests. If you’re concerned you may have active woodworm it’s worth checking your windowsills in the summer to see if you have any of these adult beetles lying around. Of course, there are other species that would also be worth checking for, since there are plenty of beetles whose larvae would be considered woodworm. Keep your eyes peeled! Spring is in the air and the burgeoning of new life all around us is not restricted to daffodils and baby birds, it also includes some less welcome organisms. Working in a museum means you really need to be aware of pests. A serious infestation can reduce objects to piles of dust in a worryingly short time. Every museum has pests, as does every house – they are impossible to eradicate completely and it’s a waste of time trying since they are mobile and can reappear just a few days (or even hours) after you’ve just finished exterminating their predecessors. Pest populations require constant management rather than blitzkrieg if they are to be kept at levels where they don’t pose a problem. In museums this is called Integrated Pest Management (IPM), at home it’s called housekeeping. Of course, our museums and homes also have a standing supply of food for pests in the form of taxidermy, wool, paper, wood, dried goods, carpets, clothes, etc. This is what we are trying to protect, so we can’t simply remove it all. Instead, we need to keep a lookout for tell-tale signs that pests are busy munching away at these items, so that particular infestations can be dealt with before they spread. Vigilance is key – everyone working in a museum or living in a house should be aware of what constitutes a pest and they should know where to report any sightings of pests (be it to Collections Management, Facilities Management, Conservation, or mum/dad). 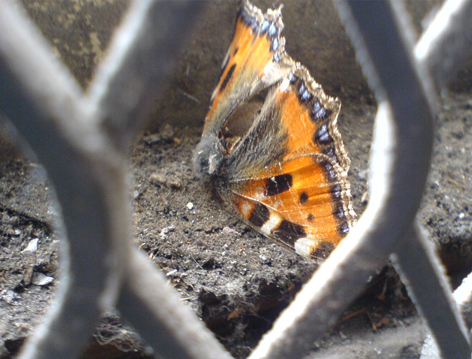 Whoever is in charge of dealing with pests should also be making sure that they carry out a bit of extra work, either by using monitoring traps to keep track of pest distributions so hot spots can be detected, and/or by keeping an eye on windowsills – a prime location for spotting pests of the insect kind. It is also useful to keep an eye open for the little signs that pests leave lying around – droppings, frass and characteristic damage. Although some pests may have had a population in your building for as long as you’ve been there (or longer), most will have found their way in more recently. Points of entry are varied and often uncontrollable (you can’t check the coats or bags of every visitor for hitch-hiking beetles and moths), but where possible there should be checks in place that reduce the ability of pests to get into a building. A quarantine area is ideal (dare I say essential) for controlling pests that can be transported on museum objects, but at home it may simply be a case of checking that your newly purchased bunch of flowers or bag of flour isn’t crawling with beetles. Various holes, vents and chimneys are excellent entry points for pests so it’s good to keep an eye on them – block up the ones that don’t belong there (like broken windows or holes in ceilings) and make sure that the ones that do belong (like air vents and chimneys) are kept clean and, where practical, protected with a mesh on the outside. Part of what inspired me to start writing this was an incident at home that Melissa and I recently dealt with. We live in a basement flat, which means that we are likely to have certain types of pest finding their way into our home quite easily. In this case it was one of the most unpleasant pests you can get – we had a rat in our kitchen. However, a rat in the garden and a rat in the kitchen are two different things. Rats carry a host of nasty diseases and they are incredibly destructive because of their droppings, urine and need to gnaw – rats gnawing wires are a common cause of fire. There’s some useful information about problems caused by rats here. Our rat appears to have entered through a hole in the wall that takes the waste pipe from our washing machine – unfortunately the hole is much bigger than the pipe and the rat must have squeezed through the gap, something that rats are very good at. Whilst clearing out the airing cupboard our unwelcome guest was spotted as it dashed for cover, reconfirming the evidence that it was a rat. Obviously we were not pleased. Once everything edible was secured in containers in upper wall mounted cupboards or hanging from wall hooks, we shut the kitchen door and hoped the rat would stay put until it could be dealt with. Fat chance – we found fresh droppings in the hall after the rat had squeezed under the kitchen door. Our deep cleaning had probably removed enough accessible food from the kitchen to force the rat to roam further afield. The advantage of this was that it suggested the rat was hungry and that there was enough disruption from our activities to have forced the rat out of its comfort zone. 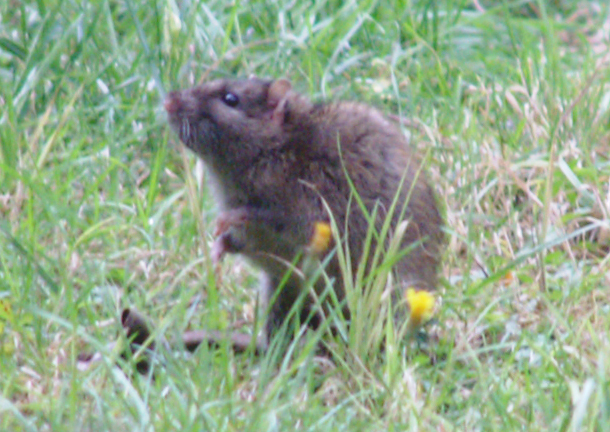 That discomfiture of the rat was an important, since rats are neophobic – they don’t like new things in their environment. Reducing the available food meant that the rat was forced to explore further and by altering its environment (i.e. removing most of the cover it relied on) we were forcing it to deal with changes, which meant that it would probably become familiarised more quickly with the traps we baited and put down at around the same time. A good strong break-back trap seemed to be the best option, since there is greater control of where the rat is killed and a trap is far more easily disarmed and tidied up than poison – it’s also a quick death for the rat (though see below). Live traps can also be used, although for rats I think they are inappropriate since releasing a rat in a new location strikes me as being irresponsible to residents of the area in which it’s released, and it’s pretty stressful for the rat. Glue boards are also available for trapping rats – these are obviously a slow way for the rat to die, unless they are checked frequently and you are willing to kill the rat yourself. We did use a sticky board under the kitchen door when it was shut (I had a rubber mallet ready to despatch the rat), but that was more as an effort to reduce the rat’s movements within the house than to trap it. Since the rat was a bit crushed from the powerful jaws of the trap I decided not to bother skeletonising it or getting it taxidermied. Instead I checked the local council website to find out what their disposal requirement was – double bagging and putting it in with the household waste – so that’s what I did. All in all an unpleasant business, but it only took two days from the first sighting for the rat to be dealt with. Our next action is to contact our landlord to get the hole sealed up properly and we will probably clear out the crumbs from the toaster and bread-board a bit more often, since that’s what the rat seemed to be subsisting on. If you have a rat then I recommend that you clean and disinfect thoroughly, make food as inaccessible as possible (easier said than done since rats can get through tiny holes, climb well and gnaw through plastic, wood and even concrete with ease), check where the blighters are getting in and work out where they are going, so that you can take steps to stop them. Most councils offer a pest control service to deal with rats (often it’s free), so if you don’t feel up to dealing with the rats then you’re probably best off contacting them. That said, I personally find it’s more effort to deal with contractors in my home than it is to kill a rat.